Explanation: A day is just under 11 minutes long on 1998 KY26, a 30 meter wide, fast-spinning, water-rich asteroid. 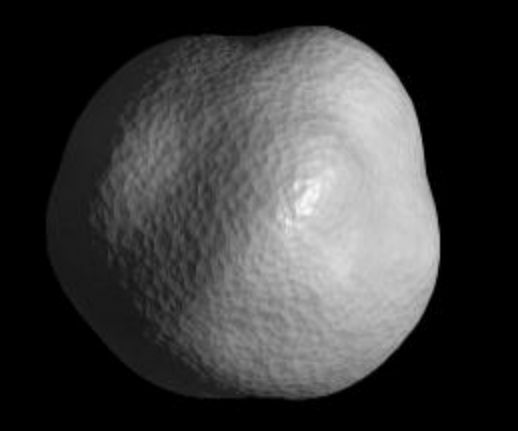 This computer simulated view of its lumpy surface has a resolution of about 3 meters and is based on radar and optical observations (click on the image for a series of surface views). The observations were made shortly after the discovery of the diminutive world which passed within about 800,000 kilometers of Earth, or about 2 times the Earth-Moon distance, in June of 1998. Around 10 million asteroids of similar size may exist in orbits that also come near Earth's, but little is known about them. However, spinning so fast, tiny 1998 KY26 can not be a loose conglomerate held together by gravity alone. Instead it is likely a monolithic chunk fragmented from a larger asteroid. As the radar and optical data suggest 1998 KY26 has a high water content, this relatively accessible asteroid could be a literal oasis for future space explorers.